The World Telemedia Marbella is an important event for the telemedia industry. For the last four years kwak has exhibited at WTM Marbella and has used this opportunity to meet peers from the telecom and media industry. It is very important for kwak to get a feell about market trends, visitor expectations and the future of the premium rate market. 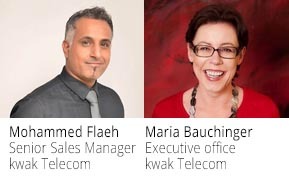 This year Maria Bauchinger and Mohammad Flaeh made up kwak’s team at the World Telemedia. Fun and sun made World Telemedia Marbella a great event. It is clear that the industry is changing constantly due to newly introduced technologies that act as positive catalysts. Most delegates were keen to identify the next industry big bang and were keen to share knowledge with each other. One of the positive aspects of the show is that both exhibitors and visitors were looking to explore more synergies and opportunities. kwak Telecom: Our impression is that the market has room for everyone. However, for kwak to have grown from 2004 to become a market leader is a great achievement despite fierce competition and market erosion. There is no doubt that the industry is changing from outside and from within but being flexible is the key to success. Maintaining pole position means kwak has to constantly look for alternative ways to grow further and establish new niches in the telecom sector. kwak is a worldwide leading telecommunications company specialized in international premium rate numbers. We pay you when you send traffic our way. If you want to learn more, just contact us by e-mail at sales@kwak-telecom.com or better: chat with us via Skype using “kwak-international”. We look forward to talking to you!